Rubber Duckie from Sesame Street is celebrates his birthday or her birthday on January 13 of every year and so do Rubber Duckie’s family and friends all over the world. According to Sesame Street lore, Rubber Duckie is more than 41 years old, because Jim Henson bought the original Rubber Duck from a store in 1969. In 1970, Ernie, a popular Sesame Street Muppet, sang about Rubber Duckie often and talked and traveled to other parts of the show, taking Rubber Duckie with him. He is still singing and traveling with Rubber Duckie. In magic years Rubber Duckie takes on the age of his or her owner and in magic stories a Rubber Duckie can be either a he or a she. Happy Birthday, Rubber Duckie/ You’re my friend and bath buddy/ You get water in my nose,/And you tickle between my toes. Happy Birthday, Rubber Duckie/You’re so pretty and so plucky/ When I get soap in my eyes,/ You find my towel and help me dry. Happy Birthday, Rubber Duckie/When I get old if I’m lucky/You’ll always be in my bathtub/Singing splish, splash, and rub a dub. Rubber Ducks have a story that goes back into the 1920s, years before Rubber Duckie came to Sesame Street. An old fashioned Rubber Duck was toy duck made out of hard rubber. Now Rubber Ducks are made out of a thick vinyl because it is cheaper and lasts longer than rubber. Most Rubber ducks come with a nozzle usually located at the bottom so when the duck is squeezed, it squeaks a happy noise. When a child – young or old – puts a Rubber Duck in the bath water and splashes it, the Rubber Duck bathes alongside the splasher with wide, happy eyes. Like people, Rubber Ducks come in all shapes and sizes. There are giant rubber ducks and tiny rubber ducks. 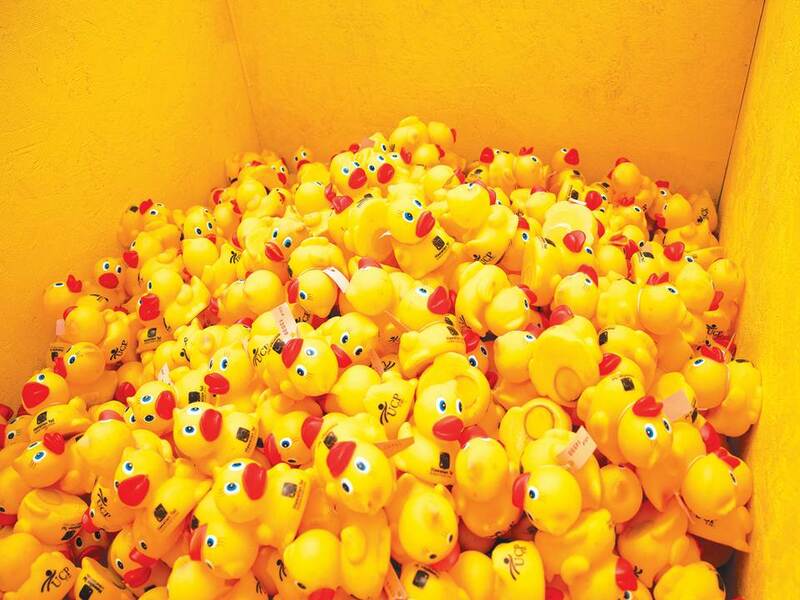 There are red, purple, yellow, pink and green rubber ducks. There are rubber ducks that wear sunglasses and rubber ducks that wear lights that shine in the water. On a more serious note, some Rubber Ducks wear pink ribbons to increase breast cancer awareness. Doctor, lawyer, and politician Rubber Ducks have been sighted in various bathtubs around the world. Occasionally, a celebrity Rubber Duck like Little Richard swims past and even more occasionally, the original Rubber Duckie floats by. Rubber Ducks have feelings, too/ Some look different than you/Some are red and some are brown/Some are short and some are round. Rubber Ducks have feelings, too/ Some have quacks bigger than you/ Others are shy and don’t make a sound/ Float away when people are around. Rubber Ducks have feelings, too/ Play with them and hug them, do/ They quack happily when you say/ No matter how you look, you’re okay! Ernie the Muppet’s Rubber Duckie is probably the most famous, but other residents of Sesame Street also own Rubber Duckies. Hoots the Owl has a pet Rubber Duckie. Dr. Bunsen Honeydew loses and finds his Rubber Duckie in an It’s Story Time short story, “Where’s Beaker?” Fozzie Bear in Muppets from Space uses a special Rubber Duckie equipped with invisibility spray. People even collect Rubber Ducks. Charlotte Lee and her collection of Rubber Ducks holds the 2007 Guinness World Record for the World’s Largest Rubber Duck Collection. She owns 2,583 individual rubber ducks. According to a 2001 story in The Sun, a British tabloid newspaper, Queen Elizabeth II keeps a Rubber Duck wearing an inflatable crown in her bathroom. A workman repainting her bathroom saw the duck and told his story to The Sun. The story made sales of rubber ducks in the United Kingdom skyrocket for a short time. Charities worldwide sponsor Rubber Duck races, releasing hundreds or thousands of Rubber Ducks into rivers, lakes, and other waterways and floating them down a race course marked with buoys. The first Rubber Duck to float past the finish line is the winner. The Free Store Food Bank in Cincinnati, Ohio, holds one of the largest Rubber Duck races, with over 100,000 ducks racing to raise money. The Ken-Ducky Derby is held every September in Louisville, Kentucky to benefit Harbor House of Louisville, a training and development organization for disabled adults. Besides the duck race, the Ken-Ducky Derby Family Festival features arts and crafts, food, and games. The Halifax, Nova Scotia, Duck Derby features 10,000 rubber ducks in the Halifax Harbor. The grand prize includes one million Canadian dollars and a trip anywhere in Canada. A Chinese factory shipped three 40-foot containers to the United States. The containers, holding 29,000 Friendly Floatees, plastic toy ducks, were washed off the ship during a Pacific storm on January 10, 1992. Nineteen thousand ducks floated south and three months later landed in Indonesia, Australia, and South America. The rest of the ducks, about 10,000 strong, headed north to Alaska and then full circled back near Japan. Hundreds of the ducks floated into the Bering Strait between Alaska and Russia and were trapped in the Arctic ice. They moved through the ice at about one mile per day and finally were sighted in the North Atlantic in the year 2,000. Happy Birthday, Rubber Duckie and his family of Rubber Ducks. Carle, Eric. 10 Little Rubber Ducks. Harper Collins, 2005. Davis, Jodie. Rubber Duckie. Running Press, 2004.